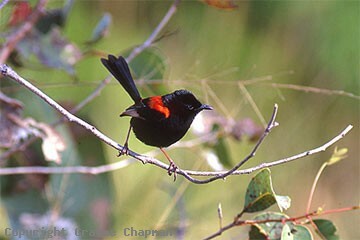 Red-backed Fairy-wrens are essentially birds of Australia's north where they are mainly restricted to the more humid zones closer to the coast. In eastern Australia they do extend south down the NSW north coast to near Newcastle and in W.A. south to Cape Keraudren, again along the coast. 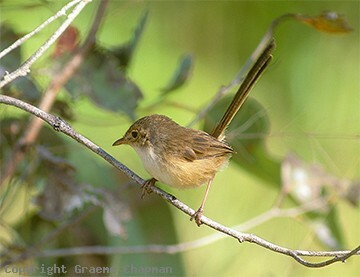 They are common around the outskirts of Brisbane and Darwin. They occur in a variety of habitats - open grassland including spinifex, tropical woodland, swamp woodland and coastal heath to name a few, but in all these places there is an essential common element, grass, the thicker the better. In NSW they are particularly fond of Bladey Grass, Imperata cylindrica. 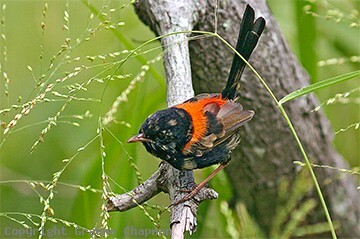 541001 ... Red-backed Fairy-wren, male in breeding plumage. Takes four years to acquire! 541002 ... 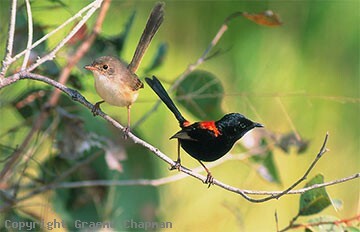 Male and female. 541202-D ... Third year males can look like this or it could be a breeding adult in moult.